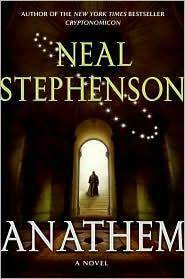 Anathem is a 2008 speculative fiction novel by Neal Stephenson. New York, New York: William Morrow / HarperCollins Publishers, 2008. Unread. Fine. Signed by Neal Stephenson with signature only on the left side of double-page title pages. (xvii) 935 pp. Incl. "Anathem" black cotton t-shirt (size - standard medium). Heavy book.. Signed by Author. First Edition, 1st Printing. Hard Cover. As New/As New. 2008-01-08. New. Ships with Tracking Number! INTERNATIONAL WORLDWIDE Shipping available. Buy with confidence, excellent customer service! 2010-01-05. New. Ships with Tracking Number! INTERNATIONAL WORLDWIDE Shipping available. Buy with confidence, excellent customer service! 2009-03-07. New. Ships with Tracking Number! INTERNATIONAL WORLDWIDE Shipping available. Buy with confidence, excellent customer service! NY: MORROW.. Near Fine with no dust jacket. 2008. First Edition; First Printing. Softcover. ADVANCE READING COPY. Near fine in bulky pictorial printed wrappers. Bonus CD present in plastic sleeve housed on front inside cover. (Hint of shelf wear at edges of wrappers. ) . New York, New York: William Morrow / HarperCollins Publishers, 2008. Unread. Fine. Signed by Neal Stephenson with signature only on the left side of double-page title pages. (xvii) 935 pp. Heavy book.. Signed by Author. First Edition, 1st Printing. Hard Cover. As New/As New. New York: William Morrow/HarperCollins Publishers, 2008 Fine in fine and bright dust jacket, lightly bumped at the head of the spine panel.. First edition, first printing.. Hardcover. 2008-09-06. Good. Ships with Tracking Number! INTERNATIONAL WORLDWIDE Shipping available. May not contain Access Codes or Supplements. May be ex-library. Shipping & Handling by region. Buy with confidence, excellent customer service! 2008-04-04. Good. Ships with Tracking Number! INTERNATIONAL WORLDWIDE Shipping available. May not contain Access Codes or Supplements. May be ex-library. Shipping & Handling by region. Buy with confidence, excellent customer service! New York: Morrow, 2008. 1st ed. Fine in Fine dj. SIGNED by the author. Signed by Author. 1st Ed. Hard Cover. Fine/Fine. William Morrow. Hardcover. 0061474096 First edition, First Printing. Signed by the author on the title page. Not inscribed, price clipped or otherwise marked. Securely wrapped, dust jacket in protective cover and shipped in a box. Full # line starting with a 1. Fine/Fine . Fine. William Morrow, 2008 Book. Illus. by Wall, Dave. Fine. Hardcover. Signed by Author(s). First Edition. Hardcover first edition, first printing. Fine (unread) copy in near fine jacket. Not a book club, remainder or ex-library copy. A clean, square copy. <b>Signed by Stephenson on the left side of the double-page title pages.</b> Dark brown boards with "NS" stamped in gold and black cloth with gold lettering. Jacket has a very small, 0.25 inch closed tear at top edge of spine panel. (This defect is common with this heavy book weighing in at 935 pages and usually caused by pulling when shelving.) Award History: 2009 Hugo Award Nominee (lost to Graveyard Book by Gaiman); 2009 Locus Award Winner for Best Science Fiction Novel; Locus Magazine 2008 Recommended Reading List - SF Novels..
Scranton, Pennsylvania, U.S.A.: William Morrow & Co, 2008. Book. Near Fine. Hardcover. Signed by Author(s). 1st Edition. An Excellent Copy - Signed By The Author On The Title Page. A First Edition, First Printing. Book Is In Near Fine Condition. Boards Are Clean, Not Bumped. Fore Edges Have A Tiny Bit Of Shelf Wear. Interior Is Clean And Legible. Not Remaindered. Dust Jacket Is In Near Fine Condition. Not Chipped Or Crinkled. Not Price Clipped. Dust Jacket Is Covered By Mylar Brodart. Thanks And Enjoy..
Macmillan Audio. New. Brand New! Audio CD. Case New. Shrink wrapped! 28 disc set. Unabridged edition. Quality guaranteed! In original artwork/packaging unless otherwise noted. Atlantic Books. First UK edition-first printing. Hardcover. Fine/Near fine. Fine/Near fine.Atlantic Books,2008.First UK edition-first printing(10 9 8 7 6 5 4 3 2 1).Brown hardback(gilt lettering to the spine,two small nicks on the edges of the cover and spine) in fine condition,with Dj(two small creases and nicks on the edges of the Dj cover) in near fine condition.Illustrated with b/w drawings.Nice and clean pages as new with two very small marks and ink mark on the outer edges,light shelf wear on the Dj cover.944pp including Note to the reader,glossary.Price un-clipped.A collectable first edition.Heavy book(approx 1.7 Kg). William Morrow. Hardcover. 0061474096 Autographed by author! Ships promptly from Texas. . Fine. 2008. William Morrow. Hardcover. 0061474096 New Condition. . New. Scranton, Pennsylvania, U.S.A.: William Morrow & Co, 2008. 1st Edition . Hardcover. Near Fine/Near Fine. 8vo - over 7¾ - 9¾" tall. From within a sanctuary for mathematicians, scientists, and philosophers Fraa Erasmas ventures outside the protective gates and finds his world poised on the brink of cataclysmic change. First printing with correct full number line sequence. Aside from some browning to the pages this is an exceptionally clean copy with no writing, marks, underlining, or bookplates. No remainder marks. Not an ex-library copy. Spine is tight and crisp and has not been creased from reading. Corners are square, and the brown and black boards are clean, flat and true with virtually no wear. The gold gilt lettering on the spine and front board is very vibrant. Dust jacket is not price-clipped ($29.95) and is likewise in great shape with just some very minor shelf wear and maybe a hint of browning to the flaps. A great copy at a great price! This collectible, near fine/near fine, first edition/first printing copy is protected with an archival mylar dust jacket cover. Satisfaction guaranteed! 2010-01-05. Good. Ships with Tracking Number! INTERNATIONAL WORLDWIDE Shipping available. May not contain Access Codes or Supplements. May be ex-library. Shipping & Handling by region. Buy with confidence, excellent customer service! 2009-03-07. Good. Ships with Tracking Number! INTERNATIONAL WORLDWIDE Shipping available. May not contain Access Codes or Supplements. May be ex-library. Shipping & Handling by region. Buy with confidence, excellent customer service! Harper. MASS MARKET PAPERBACK. B003BVK47E . New. Harper. MASS MARKET PAPERBACK. B003BVK47E Minor shelf wear . Very Good. Harper. MASS MARKET PAPERBACK. B003BVK47E Remainder mark . Fine. Harper. MASS MARKET PAPERBACK. B003BVK47E signs of little wear on the cover. . Very Good. 1st/1st. Near fine in near fine dust jacket. SIGNED by the author on title page (signature only). 1st edition, 1st printing, complete number line. Dust jacket has faint edgewear and is taped to the boards. Book has minor wear to the cap and base of the spine. Previous owner's sticker on first free endpaper. 'Anathem' is set in an Earthlike world (perhaps in an alternative reality), deals with metaphysics, and refers heavily to Ancient Greek philosophy, while at the same time being a complex commentary on the insubstantiality of today's society. The Locus SF Award-winning, British Science Fiction Association Award-nominated, Hugo-nominated, and Clarke Award-nominated novel by the Hugo Award-, Locus SF Award-, Prometheus Hall of Fame Award-, Clarke Award- winning author of 'Seveneves' and The Baroque Cycle. LONDON: ATLANTIC BOOKS, 2008. First printing. Hard cover with illustrated dust jacket. Slight wear/creasing on DJ edges. ISBN label on back of DJ. Brown boards with gilt titles on board spine. Side edges of some of the book's pages are slightly creased and the book does not close completely flat. Overall clean, tight pages. Strong binding. No inscriptions. Heavy hard cover. 937 pages. Location: M2. First UK EDITION. Hardcover. Very Good/Very Good. 12mo - over 6¾" - 7¾" tall. William Morrow, 2008-09-09. Hardcover. Used:Good. Harper. MASS MARKET PAPERBACK. 006147410X . New. Harper. MASS MARKET PAPERBACK. 006147410X Remainder mark . Fine. New York: William Morrow, . First edition. A fine copy in a fine dust jacket. (18849). Octavo, boards. "Set in a world that is similar but not identical to our own, "Anathem" imagines a modern-day monastic order whose members have pledged to live their lives without computers or electronic technology. Having long ago set aside such un­answerable questions as "Does God exist?" these alternative Augustines are free to contemplate issues of math, physics and philosophy; depending on the order they belong to, they are allowed to visit the outside world as much as once a year or as little as once a millennium." "...Stephenson's larger point, perhaps the most resonant and consequential in all of "Anathem": the absence of religion does not prevent passionate and violent disagreements over theoretical matters; such conflagrations can occur even in societies that hold rational thought as their highest virtue." - Dave Itzkoff, New York Times book review, 10/17/2008. NEW YORK: WILLIAM MORROW. VG/VG INSCRIBED TO PREV. OWNER & SIGNED BY AUTHOR. Pages: 937. . 2008. 1ST PRINTING. HARDCOVER.. Condition: VG/VG INSCRIBED TO PREV. OWNER & SIGNED BY AUTHOR. Pages: 937. New York: William Morrow & Company, 2008. Advance reader's Edition, Trade paperback, Fine,. New York: William Morrow & Company:, 2008. Advance reader's Edition, Trade paperback, Fine, 934 pp. Bonus CD included. HARPER PERENNIAL. New. 8.12 x 5.59 cm. 2008-01-08. Good. Ships with Tracking Number! INTERNATIONAL WORLDWIDE Shipping available. May not contain Access Codes or Supplements. May be ex-library. Shipping & Handling by region. Buy with confidence, excellent customer service! Atlantic Books, 2008. Nice condition. VG+ in like d/j. 937pp novel. Heavy book - airmail much extra.. First UK Edition. Hard Cover. Very Good/Very Good. ATLANTIC BOOKS: GROVE ATLANTIC LTD. Perfect Paperback. 1843549166 Please allow 4 - 14 business days for Standard shipping, within the US. Thank you for supporting our small, family-owned business! . Fair. 2008-01-01. London: Atlantic Books, 2008. Beautiful, crisp, unread. British edition. . First British Edition. Hard Cover. Near Fine+/Near Fine+. William Morrow. Hardcover. 0061474096 First Edition, First Printing [1st Edition, 1st Printing]. In Very Good, mylar-wrapped dust jacket. . Very Good. 2008. First Edition, First Printing [1st Edition, 1st Pr. William Morrow. Hardcover. 0061474096 Like New Condition. . Fine. Macmillan Audio, 2008. Audio Book. Good. Audio CD. 28 AUDIO CDs in the original printed box polished for your satisfaction. Some shelf wear, edge wear and fold mark to the case. The Audio CDs are in individual envelopes, protected and clear sounding. A nice looking set! Enjoy this reliable audio performance..